Tens of thousands of young people are marching for life in Washington, D.C. 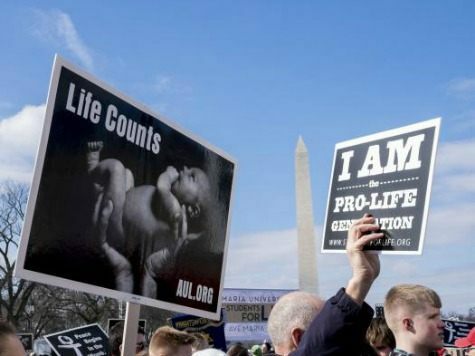 In an exclusive interview with Breitbart News, some students from The Catholic University of America (CUA) in the nation’s capital say they are marching to show millennials care about women in crisis pregnancies and their babies. CUA student Christiana Gellert says it’s important Americans know millennials care about something more than what’s superficial. “I’m here to show that millennials care about something more than just changing our profile pictures or putting up an angry status on Facebook, to show we’re willing to brave the cold weather and the blizzard for what’s important,” she explains. Kimmel says Americans need to be reminded that abortion has been legal in this country for over four decades. CUA student Mary Castellano tells Breitbart News she is marching to give children and mothers in crisis pregnancies a voice. Castellano – a sidewalk counselor at abortion clinics – says she knows very well first hand that people going into an abortion clinic often feel they have no choice.